Petra Janecek is a civilian freelance war journalist active during and after the Human-Covenant War. She gained critical acclaim for her coverage of both the SPARTAN-II program and the Battles of New Mombasa and Voi. Petra Janecek was born on May 4, 2511 in the city of Serif on the human colony world of Lenapi. The Janeceks had a dog named Handsome. At a young age, Petra and her family moved to the city of Tricode Village on Mars and became friends with Thomas Lasky. She attended Cub Reporter School and went on to become an accomplished war journalist throughout the Press Corps. Petra showed great expertise in her work; her coverage of the Spartan-IIs gained her many awards after the Office of Naval Intelligence's Section Two had gone public about the program. She had also done reports from ground zero at both New Mombasa and Voi. At Mombasa, Petra and fellow journalist Benjamin Giraud saw Master Chief John-117 battling Covenant forces. Following the end of the Human-Covenant War, Petra arrived on the unscathed planet Forseti. While collecting material for a new story, she stayed at Forseti Northern Terminus 37 in Four Winds. There she examined Cortana's message from High Charity leading her to speculate on the possibility that the Ark could be used as a weapon. She immediately called a cruise line to exchange her ticket and head directly to Earth. In March of 2558, Janecek was in Castiglione on Escala III wanting to find a story involving a backwater diplomat. It was there that she met with Captain Lasky and Spartan Naiya Ray. Lasky informed her of the ambush at the secret diplomatic negotiations and requested her help in uncovering a spy within the UNSC's ranks. Petra agreed to aid the crew of the UNSC Infinity in return for information about the Master Chief. Janecek, Lasky and Ray traveled to the port city of Kor Delban on the Sangheili colony of Karava to meet with her informant, Zef 'Trahl. Before meeting with 'Trahl, the trio were involved in an altercation with a Sangheili named 'Lordan and two of his compatriots. Petra shot 'Lordan in the head with her revolver, killing him and prompting the other assailants to retreat. In a local bar, Trahl gave them information on Vata 'Gajat, as well as the identity of the UNSC traitor as Captain Daniel Clayton. After the encounter, Petra parted ways with Lasky and Ray, who returned to Infinity in the wake of a devastating attack on the ship by the New Colonial Alliance during their time away. In 2558, Janecek met with Benjamin Giraud at ONI's Boston headquarters in the United Republic of North America on Earth. Outside of the facility, Giraud revealed he had inadvertently insinuated that ONI was providing him with intentionally false sources. Janecek initially told him to stop questioning the Naval Intelligence sources and just play along, but she grew worried when Giraud informed her that he had essentially called ONI out on Waypoint while talking to a source and believed that ONI had flagged the conversation. Shortly after, Giraud had been called to the ONI facility for a meeting with Commander Michael Sullivan, Senior Communications Director of ONI. As Giraud grew visibly stressed, nearby ONI surveillance cameras took notice of his distressed form and listened in on their conversation. Janecek noticed this, however, and changed the subject to a topic of irrelevance until the cameras stopped monitoring them. Afterwards, she consoled him and told Giraud that the worst thing that could happen was him losing the job. Giraud proceeded to reluctantly enter the ONI facility. While on the returning flight back to his residence from Boston, Giraud encountered actor Jakob Walker—who had been hired by ONI to act as one of their sources for Giraud. Giraud ultimately realized that not only had ONI been deceiving him, but they had no respect for him. Furious, Giraud posted all of his findings and recordings online for the public to see. When Janecek realized that Giraud had posted the conversation she had with him at Boston online without her permission, she traveled to his residence and forcibly entered his apartment; Ray Kurzig was also there to provide Giraud with information he had requested. She attacked Giraud for betraying her trust and threatened to shoot him if she ever saw him again. Giraud apologized profusely and admitted to not thinking about what he was doing, though Janecek grew irritated after Giraud revealed he was recording their current conversation. After Janecek called him sloppy, Giraud revealed that he had conspiracy theorist Mshak Moradi securing his line. Having encountered Moradi before, Janecek correctly guessed that he was listening to their conversation that very moment, leading to Moradi revealing that he had hacked into Giraud's COM pad weeks earlier. Kurzig then revealed that Deon Govender, a man that Giraud had interviewed, had actually been deceased since 2551—insinuating that ONI had hired an actor to portray Govender for Giraud's interview. Shortly after the revelation, Janecek and Kurzig left Giraud's apartment with the intention of cutting ties from the incident to prevent being incriminated alongside Giraud. Though as she was leaving, Janecek told Giraud to keep the recording he had made of the conversations that had just taken place. Several days later, Janecek discovered that John-117's attack on a UEG-alien peace conference had been leaked online. She contacted Giraud and asked him if it was his doing. After realizing that he had not leaked the news, Janecek began telling him what politicians in the Inner Colonies were saying about the Master Chief. However, the conversation ended when ONI cut off Giraud's communications. After ONI set Benjamin up, publicly discredited his story and made him disappear, Janecek decided to pick up where Giraud left off and took over his investigation regarding John-117. Commenting on Giraud's rather overt sloppiness as a journalist, Petra was confident she would not make the mistakes he had made and would take a more ruthless approach to the investigation. While investigating aboard a transport freighter in the fringes of human space, Janecek was arrested by ONI's acquisition team. Janecek is a perfectionist, and has a weary, semi-fatalistic viewpoint toward her role as a UNSC propagandist. She often sold her stories to The Magellan. Janecek also holds a deep respect for John-117, and framed her Voi story on how "a single human soldier had single-handedly changed the entire course of the war." Her perfectionism led her to discover a discrepancy in Cortana's distress signal sent to Shadow of Intent during the final days of the war, leading her to theorize that there was in fact another doomsday weapon other than the replacement Halo ring. She is also shown to be pragmatic as she did not interfere with ONI's operations to silence Benjamin Giraud. However, she was angry at being used as a pawn to feed Giraud information and leading him into a trap. As demonstrated after Giraud was arrested, she is neither above getting her hands dirty nor held back by ideals when she decides to take over the investigation. 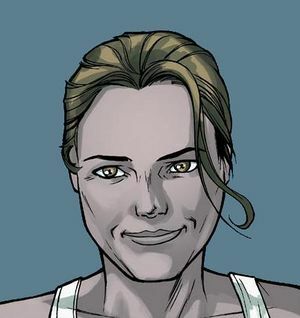 During her introduction in Halo: Escalation #4, Petra closely resembles Chell, the protagonist of the Portal series as she is portrayed in the second game. Notably, both wear a white tank top along with orange jumpsuit-style pants. Petra is voiced by Cobie Smulders in Hunt the Truth. ↑ Twitter: @HaloArchive @HaloWaypoint Was wondering how long it would take for someone to find that. ↑ Xbox Wire: Has the Master Chief gone AWOL?